Upgrade your residential or commercial property with professional marble services. Marble is a type of limestone (or dolomite) that forms after being exposed to excessive pressure for a long period of time. It is a beautiful and sophisticated stone that is both moisture-resistant and durable, making it the perfect material to enhance flooring and countertops. Our marble cleaning, marble polishing, and marble restoration services are the perfect fit for your needs. Our marble polishing, marble restoration, and marble cleaning technicians in San Pedro and the surrounding areas are professionally trained and possess more than a decade of experience! We use a wide variety of techniques to help your natural stone surface keep its beautiful look. Our stone restoration company can restore your marble to its original appearance! We specialize in marble restoration, marble polishing, and marble cleaning services. Contact us today for a free estimate, and continue reading below to learn more about our services! Unlike metal and wooden surfaces, marble polishing requires a delicate and detailed process. 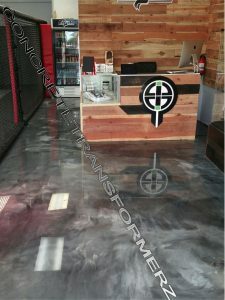 At Concrete & Marble Transformerz, we proudly provide marble polishing that can help you remove stains and buildup, repair damage, and create a glossy shine. It’s difficult for the average person to use polishing powders, pastes, and diamond polishing pads on their own, and attempting to do so on your own can often create more problems than solutions. Our marble restoration experts have the required training and experience needed to deliver a polish that breathes new life into your marble. Marble is a porous stone, meaning that it is susceptible to stains and water damage if it remains unsealed. There are a number of different sealants available on today’s market, and we’ll help you find the right solution for your home or business. For instance, you may need an oil-repellent sealant in addition to a water-repellent one in order to completely protect your investment. We know how important it is to keep your marble protected, so please get in touch with our marble sealing experts to schedule an appointment! Marble can last a lifetime with proper maintenance, but many home and business owners fail to keep up with the demands of this beautiful stone. If your marble has lost its luster, or is becoming scuffed and scratched due to normal wear and tear, then get in touch with our marble restoration experts to schedule an estimate for your home or business. You might have a few small cracks that need to be repaired, or you may have a chipped spot that’s been unaddressed for years. No matter what shape your marble is in, our marble restoration experts will be able to restore it to its former beauty! Contact Us for Marble Polishing, Restoration, & Cleaning Services in Southern California! Contact our restoration company today to learn more about marble polishing, marble restoration, & marble cleaning services in San Pedro CA! Concrete & Marble Transformerz’s Top Rated Local® floor polishers can help you rejuvenate the marble in your home!